Discarded empty plastic PET bottles like those used for bottled water are unsightly, cause problems for wildlife and can take hundreds of years to break down. Can they be put to good use? This activity looks at some of the great things that you can make from old PET bottles at home or at school and encourages you to raise money for charities such as ‘Liter of Light’, an organisation that converts old PET bottles into ceiling lights for disadvantaged people across the world. Learn about the environmental impact of discarded PET bottles. Learn about the Liter of Light project. Learn about some of the great things you can make using old PET bottles. 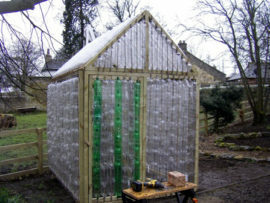 Run a PET project – collect discarded bottles and make something fantastic! Optional: Sell your creations to raise money for a good cause such as Liter of Light.